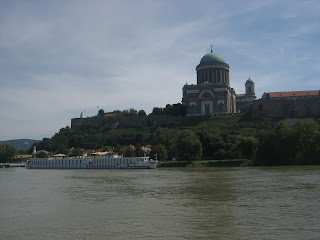 On one of the days in Budapest, we took a boat ride to one of the small towns on the Danube "Bend" called Szentendre. It lies up-current from Budapest and takes 1 1/2 hours to get there by boat. On the way up, there are excellent views of Budapest and we got a good look at Margaret Island as well. But once outside of Budapest, it got pretty rural with trees, mangroves and other green foliage coming right down to the water and an occasional house. Szentendre is a small town that didn't take us long to see. It dates back to medieval times (like so many places around here). It has small cobblestoned streets with a number of old churches. I mentioned to Diane that parts of it looked like Greece or Italy on the Med. Some of it is a bit touristy. But as we wandered from one side of town to the other you do get the distinct feeling that this is the real thing. In fact this is where early Budapest settlers fled to, while escaping the Turks. We ended up at the top of the hill at an ancient Catholic church, overlooking the town. We stayed for a few hours having a beer and a Croque Monsieur at a local pub. We then took the boat back, which only took an hour since, this time, we were going with the current. The places we've visited on this trip are all steeped in ancient history. A number of places date back to Celtic and Roman days. Empires seemingly came and went. Even today, the Hungarians talk about before and after the "regime change" of 1989. Also of interest is the Hungarian language. Usually, we try to learn a few words and phrases before arriving in a new country. But it was really difficult for us to do that in Hungary. The language is called Magyar. It originated on the eastern side of the Ural mountains. Along with Finnish and Estonian, it's one of Europe's few representatives of the Finno-Ugric family of languages. This makes it really difficult for the average traveler like us. For example, the word "Hello" is Jonapot (pronounced yohnapoht). What the heck do you relate that to when trying to remember it? Or how about the word for "cheers"? It's "agha-she-gadra". After a couple of beers that sure doesn't roll off your tongue! On our last day in Budapest, our schedule was an easy one: in the morning visit the central market, in the afternoon go to one of the Turkish baths that BP is so well known for and in the evening go wine tasting. How can you beat that kind of a day? 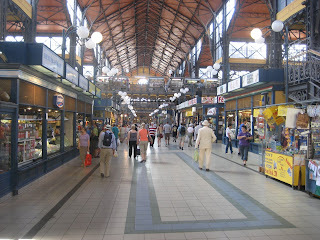 The central market is indoor and very large. The lower level has a huge variety of foods while the second level has clothing, souvenirs and restaurants. I was tempted to buy some hand-made knives from a family who had been making knives for generations. Diane looked over the numerous leather purses. We walked around and shopped for a couple of hours, buying a few trinkets. Later we lunched on a cabbage roll (very Hungarian), salad and a beer. All the food looked delicious. It's too bad we weren't feeling more hungry. After the market we headed for the baths. The Szechenyi Bath is a public bath. 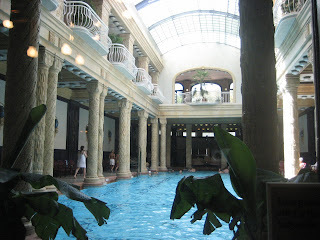 But since it was further away for us we opted for the private, more opulent baths at the Gellert Hotel. From the market, we just had to cross the Danube to get to the Gellert Hotel. At first it was a bit confusing figuring out how to order your ticket because of all the different combination of things to do (baths, pools, saunas, thermal pools, mud baths, massages). We just ordered the basic plan (about $16) so we could use the various pools and thermal pools. Once inside, we found our way to the coed locker room and got a cabin (basically a large locker that we both can stand in to change). For the locker room help we had envisioned a surly man or woman hold-out from the Iron Curtain days. But instead we got a very accommodating, surly-looking woman who, actually, was quite friendly and helpful. The coed pools were great. Very ornate tile and ceramic work (i.e. lion figures spitting out water into the pools). We enjoyed going from one pool to another and eventually had to split up to enter the thermal pools because they were unisex. Apparently some folks choose to go in the buff. The men I saw, mostly wore a bathing suit. Some wore a small apron around the waist to hide their manly hood. Very modest, indeed. Diane said that she saw a couple of older women sans suits who should have worn full body suits. A few hours of jumping around from pool to pool and we were ready to split and go back to the hotel. We were mush. In the evening we went to a small wine bar on the Pest side that we had heard offered wine tasting on Tuesday evenings featuring a wine maker. It was a warm and cozy looking bar with lots of wine bottles displayed on oak-walled shelves. Surprisingly, the wine maker was a good looking brunette from the Villanyi area, in the very south of Hungary, 30 km. from the Croatian border. We were served two wonderful dry and subtle Roses, a Pinot Noir, a Kadorke (Hungarian red varietal), a Merlot and three Bordeaux blends. All the wines were well crafted wines, some that were 14% alcohol. The Pinot didn't have much aroma but it was a well balanced wine with a good finish. None of the wines was cheap, with prices ranging from $8 to over $40. While walking the streets of Budapest, I noticed lots of interesting billboards advertising upcoming international talent such as BB King, Tom Jones, Leonard Cohen and others. The following day we got off to an early star, checked out of our hotel and were at the hydrofoil boat dock by 7:30am. 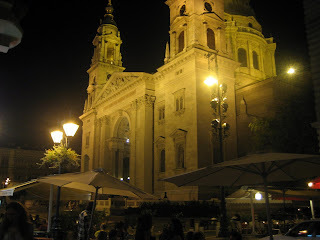 We hadn't seen all of Budapest, but we'd made a dent in it. The hydrofoil boat ride to Vienna was okay, but nothing exceptional. Next time, we'll definitely take the train or fly. 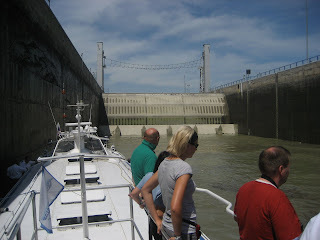 There are a few towns of interest, a couple of locks that we had to go through that were fun, but mostly it was a hot and uneventful boat ride. When we got to Vienna, we hustled to the underground Metro and found our way to the main train station (actually one of three main train stations - but we had done our homework and knew where to go). Shortly, we were on our way back to Bernau, Germany. It was a pretty new and fast train that had a GPS screen in each car displaying our position and speed (200kph on straight parts).